Happy Black Friday to you as well! There are some great crafty sales today at some of my favorite shopping venues, so be sure to read to the very end for codes and links for wonderful savings! STINKIN’ CUTE! I love this set and had a lot of fun coloring it with Copic markers. I added a little bit of Wink of Stella clear over the ornament, the jingle bell on the elf’s hat, and added a few sparkles on his cheeks a la The Santa Clause! I also added some details with my favorite Sakura Stardust pen. After I had gotten the whole card put together, I decided that the white space over the elf’s head was too big and prominent, so I carefully stamped snowflakes around all the images, using Altenew’s Arctic ink. I used MFT’s Circle Burst stencil with Emerald Envy ink to create a cute pattern on the Lemon Lime Twist card stock. I stamped the greeting directly on this piece with Versafine Onyx Black ink. I added some Wink of Stella clear to the Emerald Envy frame that I cut using MFT’s Single Stitch Line Frame dies. A couple of Doodlebug Gold Glitter Sprinkles added a nice finishing touch. This card is so happy, and that makes me happy too! This is a great day to be shopping too, as there are some great crafty sales! Ellen Hutson LLC – Celebrating their 11th anniversary with 20% off on all in-stock items with code CELEBRATION17 from Friday, November 24th through Monday, November 27th at 11:59 PST. 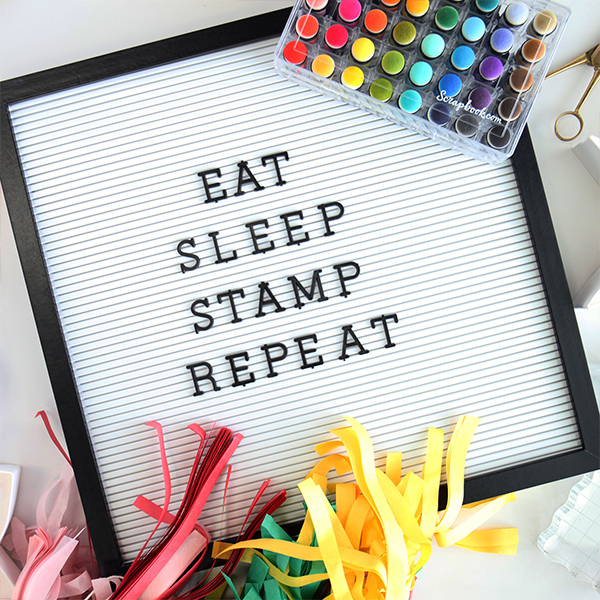 Simon Says Stamp – 15% off site-wide with code SWDE524 or $5 off with any order $5 or above with code TAKEFIVE on Friday, November 24th only. Scrapbook.com – $10 off $70 order with code HOLIDAY10 from Friday, November 24th through Sunday, November 26th at midnight. Gina K. Designs, LLC – 25% off your entire order with code THANKFUL from Friday, November 24th through Monday, November 27th. Blick Art Materials – Discounts from 15% to 30% off starting with orders of $69 or more and free shipping on orders of $25 or more with code WKD2017 from Friday, November 24th through Monday, November 27th. Sizzix – Up to 85% off with free shipping for orders of $25 or more from Friday, November 24th through Sunday, November 26th. Amazon.com – Always great Black Friday deals!